Edublogs webinar overview – “Show & Tell” | E-verything! This session was a little different – discussion in a previous Serendipity session gave rise to the idea of taking a brief look at how individual teachers use a tech tool of their choice. Thus the “Show and Tell” session was born. We had three fantastic short presentations from Rodney (@techyturner), Tracey (@mmebrady) and Sandra giving us great insights into exciting ways to use technology with our students. The session was recorded as usual – including some preliminary chat about the wildlife in our respective backyards. Please let me know if you access the recording. Rodney started proceedings by telling us about “clickers” and the many applications of these in his classroom. He explained that he is able to get instant feedback on student understanding and how much the students enjoy using the clickers. This prompted text chat discussion and questions about the range of activities that can incorporate clickers. Tracy told us how she has used GoogleVoice in her classroom and has utilised the students’ own mobile devices – a great solution for someone who has little technology available in their classroom. 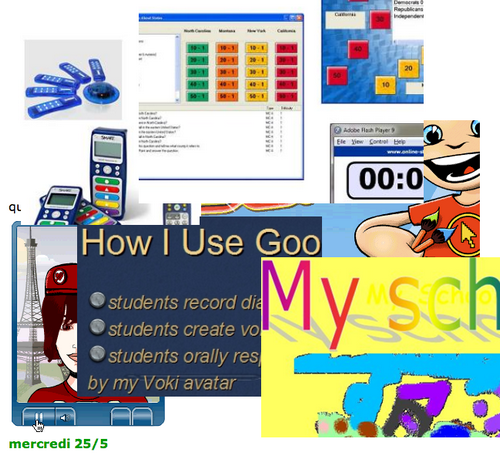 Because Tracy teaches French the oral dimension is critical and Tracy has used GoogleVoice to enable her students to respond orally to questions posed by her Voki. Sandra finished off the session by telling us about how she has used “Max’s Toolbox” with very young students. This is an interface that is used within an MSOffice environment and has icons and tools that are simple to use. Sandra showed us how Kindy students have created simple slides on themes relevant to them. This session was excellent – it was a fantastic way to share teaching strategies and tools, without the pressure on one individual to fill a whole session. Three seemed to be just the right number of presenters and we had lots of discussion and questions around the topics. “Show & Tell” is definitely a theme to repeat! Our next session is an Edublogs “Serendipity” session on Thursday June 23rd at 23:00 GMT/UTC (Afternoon/Evening USA) or Friday June 24th at 7am West Aus, mid morning Eastern States Aus depending on your timezone (check yours here) – in the usual Elluminate room. This is one of our fortnightly unconference sessions where we invite you to bring along your “hot topics” and “burning issues” for our poll on the topic of the day. This entry was posted in Uncategorized and tagged cell phone, clickers, Edublogs, Elluminate, Fine Focus, Free Online PD, Google Voice, interactive, mobile learning device, mobile phone, paint, show and tell, student engagement, teaching strategies, technology, tools, virtual classroom, Voki, webinar by johart1. Bookmark the permalink. Thanks for moderating — wonderful as always — and for helping me with my powerpoint. Just when I think I’m getting more tech savvy, I’m totally confounded by something totally basic! I also love the collage you did above — very cool! Thank you for the opportunity to share. I really enjoyed taking time to share and to listen how others use similar tools differently than I. I have to tell others about this webinar. Rodney, it was great to hear how you are able to use clickers in your classroom. It’s a great webinar series. The people are fantastic, and I always learn something new!